Readers create images in their minds that reflect or represent the ideas in the text. These images may include any of the five senses and serve to enhance understanding of the text. 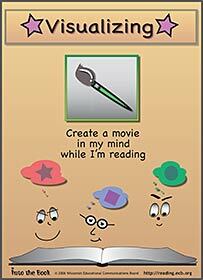 Create a movie in my mind while I'm reading. To practice visualizing, students use computer drawing tools to create a series of images that they see in their mind as they read a given text. Learners also select music to represent each part of the text. Students may choose between six passages including fiction, non-fiction, poetry, a math story problem, a voicemail or a musical selection. In this episode, In this episode, Mrs. Pingel's students are introduced to the strategy of visualizing in their music class, and then explore the process further during a small group guided reading lesson. Using his five senses to visualize makes the story so real for Trent students that he is drawn literally "into the book." Thanks to his new understanding of the strategy, he is able to help a character in the story get out of a bind. Later, he applies the strategy to solve a problem of his own at home.